Wesley is the last surviving member of a prestigious clan of knights. When civil war broke out, his family marched to war, leaving young Wesley to fend for himself. Though conditions were harsh, he never forgot his roots and has now become a man of honor. Wesley dedicated his life to serving his lord. His usual duties include keeping the peace and repelling invaders. A tough job for a tough man. Creates a mid range tremor, dealing damage to all enemies in a cone and inflicting Stun for 1s. Summons a shield of light that absorbs incoming damage. Shield lasts 4s or breaks after taking too much damage. Absorbs up to %y DMG. 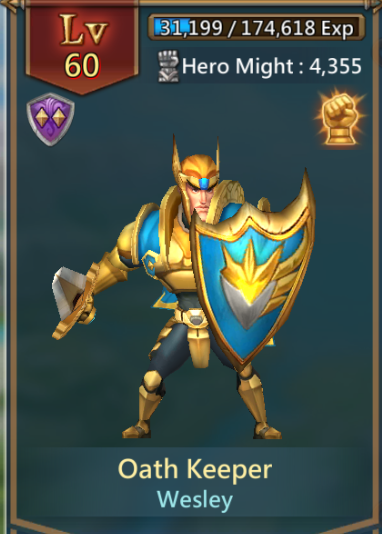 Strikes an enemy with his shield, dealing damage and inflicting Stun for 3s. The Oath Keeper's will to live keeps him fighting. Just check him and see. Chadra is a renowned archer with a reputation for bringing bad luck to others. 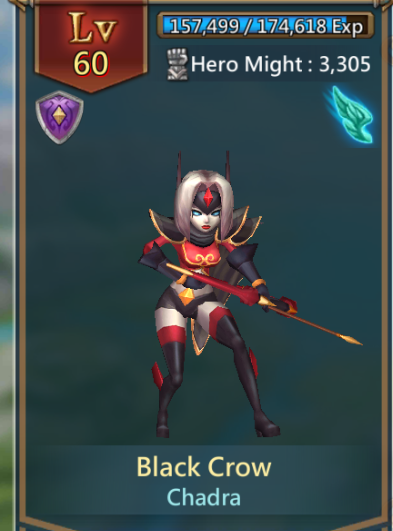 This earned her the nickname "Black Crow." Like all other Drows, Chadra hates Humans for their tyranny. She participates actively in their wars, hoping to instigate further conflict. What better revenge is there than to let the surface dwellers kill each other?" Fires a barrage of arrows, blanketing a medium area. 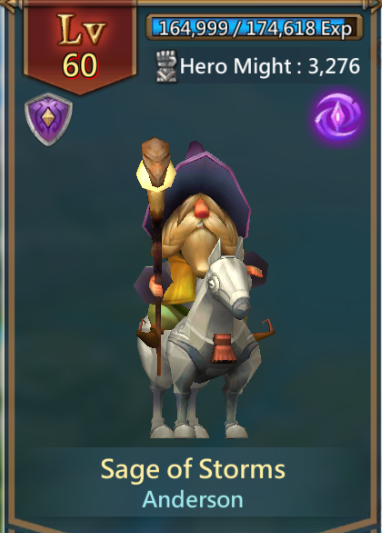 Hits enemies in range 3 times each. Deals %x Physical DMG per hit. The Black Crow's lust for revenge empowers nearby allies. Anderson is a quiet and inconspicuous man. But within that frail body rests the immortal wizard who saved the world from countless extra-dimensional threats. In his youth, Anderson's forbidden magic saved the world. Unfortunately, the price he paid was the curse of immortality; surviving eternity while every person he's ever cared for passes on. Unleashes a tornado at a target area for 5s, dealing damage to enemies in a medium area. Deals %x Magic DMG per second. Summons a bolt of lightning to strike a target, dealing damage to all enemies in a medium area near the target. Summons a breeze in a medium area around Anderson, increasing allies' Reflex for 8s. Increases allies' Reflex by %y. The Sage of Storms turns the battlefield into a static field, reducing enemy MDEF. The Snow Elves have always avoided contact with Humans. They believe interacting with lower life forms would impede their evolution. Alice, however, was curious. She wanted to understand Humans. Eventually, she did the unthinkable - she left her people to meet the Humans. Unfortunately, her presence gave the Humans another reason to go to war. Everyone wanted the beautiful Alice to be their Queen. Summons a gust of wind from long range, dealing damage to all enemies in a line, inflicting Freeze for 5s. Creates an explosion of frost at a target, dealing damage to all enemies in a small area around the target. 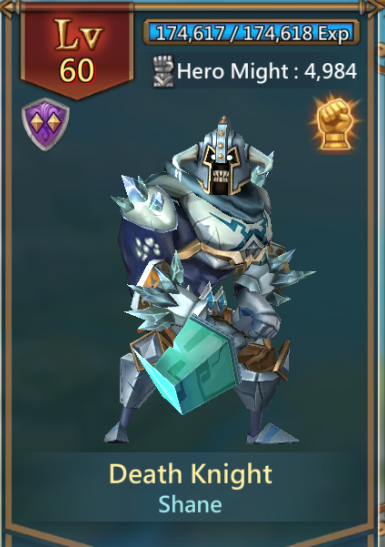 Encases the weakest ally in an armor of ice, increasing their DEF for 8s. 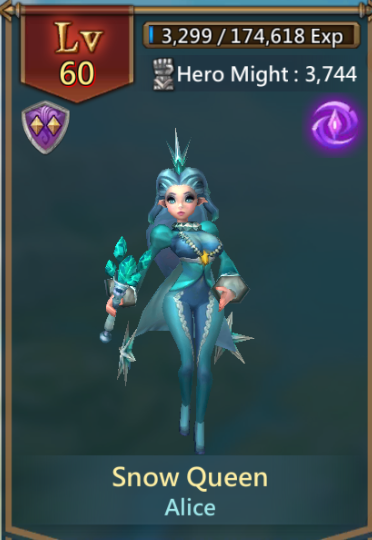 The Snow Queen clutches an enchanted crystal, increasing Recharge/second of all allies. The world's greatest fire mage, Monica is always on the hunt for excitement. 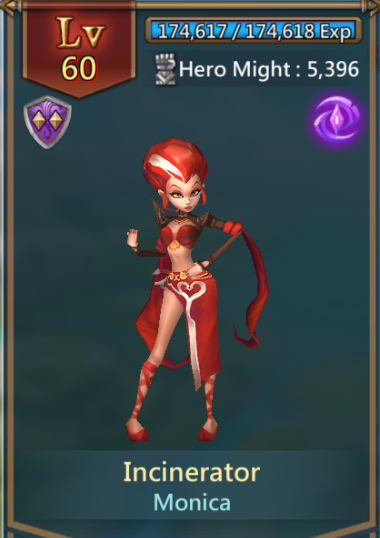 No flame is too hot for her to handle. Her personality however, is cold, cunning, and calculating. She'll stop at nothing to achieve her goals. Some believe that Monica joined the war just to find a worthy opponent. Others believe she's just killing time. Either way, don't play with fire. Summons a rain of fire at a target area, dealing damage and Stunning all enemies in a medium area for 1s. Unleashes a mid range wave of flames, dealing damage to all enemies in a line and inflicting Stun for 1s. Engulfs an enemy in flames, dealing damage and inflicting Burn for 4s. Monica unlocks her latent potential, increasing her MATK. 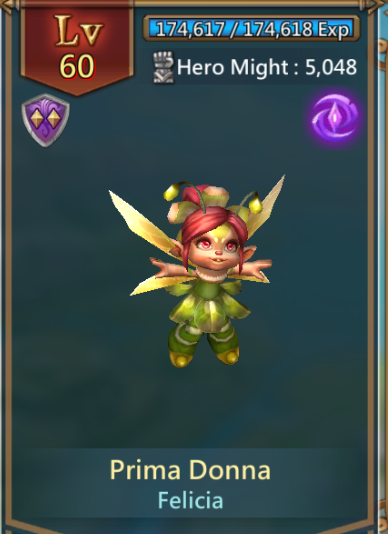 Pixies are petite, winged sprites with magical voices. Many have claimed to witness miracles after listening to a Pixie sing. Legends also claim that Pixie wings serve as a portal to the dream realm. In theory, it's possible for one to live in dreams. Amidst this endless war, Felicia can't shake the doubt that her reality is merely a dream. Sings Athena's Anthem, healing all allies and applying a heal for 4s. Restores %x HP. Also restores an extra %y HP per second. Unleashes a deafening howl, dealing damage to a target. Performs a special song, increasing MATK of nearby allies in a medium area for 8s. Felicia covers herself with magical pollen, increasing her Healing Focus. Increases Healing Focus by %y. A powerful lord who nearly conquered the world, Shane grew obsessed with immortality in his older years. Finally, he led his army on a journey in search of eternal life. No one knows what Shane and his men faced on their journey. But one thing is certain, Shane returned alone and undead. Unleashes a chill, dealing damage and inflicting Knockback and Freeze to nearby enemies in a large area for 3s. Impales an enemy, dealing damage to all enemies in a line. Revives when killed in battle and increases ATK for 10s after reviving. Revives after 5s with %x% HP. Once per battle. Increases ATK by %y. Shane imbues his body with enchanted ice, increasing his STR. In the dead of the night, a Shade sneaks past any guard. Slipping into the room of its quarry, Blink quietly slides a dagger across its victim's throat. Seconds later, Blink vanishes back into the dark night. 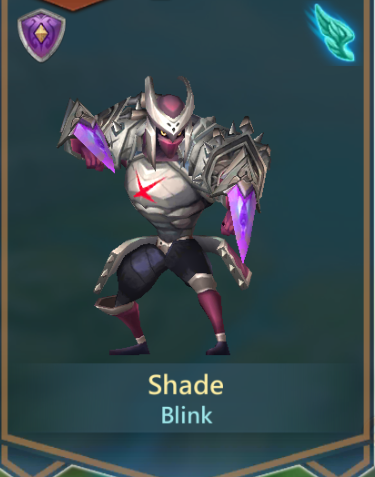 Blink is a brutal and efficient assassin who has never failed a mission. Nothing gets in the way of Blink and its prey. Moves quickly to the side of an enemy to attack, dealing damage to all enemies in a small area and hitting them 3 times each. Assumes an elusive stance, increasing Reflex. Flings a dagger at an enemy, dealing damage and inflicting Silence for 5s. Deals %x DMG. Silenced enemies can't use Magic. The Shade's training enables him to target an enemy's weak point consistently. Giants live their lives at a much slower pace. A day for them could be a century for the other races. When One-Eye woke from his afternoon nap, he realized that hundreds of years had passed and his friends were gone. He decided he would head to the Human realm to make new friends. In order to fit in better, he traded his long life for a Human-sized body. Perhaps he won't be alone anymore. Spins his massive body and rushes at the enemies, dealing damage 5 times to enemies in a small area. Inflicts Stun for 1s. Flings a steel ball from mid range, dealing damage to all enemies in a cone and inflicting Stun for 1s. Body slams the ground, dealing damage to all enemies in a medium area and inflicting Stun for 1s. 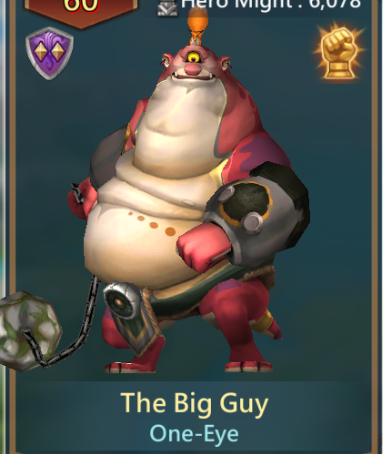 The Big Guy's big belly allows him to block all damage from enemies. Reduces DMG taken by %y%.